Generational theory: the world is approaching the tip of another global crisis ! - Upstate Berserkers vs "Gray Cardinals".... | Upstate Berserkers vs "Gray Cardinals"…. « Timeless: Michael CREMO: The human race has existed for millions of years. Generational theory: the world is approaching the tip of another global crisis ! November 28th, 2014 by berserker | Posted in Out of Bounds !, Poliitika. Authors William Strauss and Neil Howe has become known for his theory in terms of generations, the mood of the population of certain repetitive cycles. Comparing the history of the theory of these cycles can be noted that the US and the rest of the developed world is increasingly growing in the middle of the global crisis, which reaches a dangerous peak in about fifteen years. 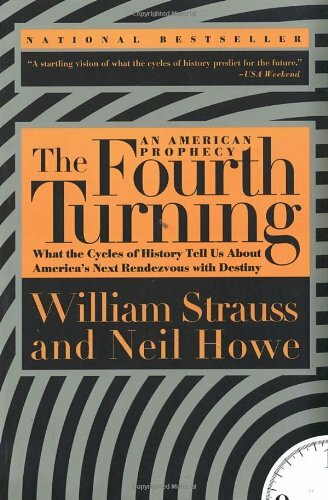 In the book “The Fourth Turning” wrote the authors of the crisis prompted by the amount of precipitation may be something quite ordinary, such as elections or halvaendelist as the economy crashed. This, however, leads to spark a chain reaction in which the basic elements (debt, the disappearance of the middle class, global unrest) connection and lead society to the brink of rupture. Strauss and Howe said that the world is a major problem is that those in power to think linearly, making decisions based on their own interests, but in the belief that their actions do not have consequences and that their position does not invalidate anything. In fact, the history and the people running the mood in circular cycles, forming a pattern of a certain regularity. Those who have not taken the time to examine what the consequences of this behavior led, are now struggling with understanding the changes. Linearly thinkers are accustomed to human advancement can be controlled by various measures, which are described by Edward Bernaysi book “Propaganda”. Namely, the organized habits and opinions of the people conscious and intelligent manipulation of an important element in democratic society. Those who run this mechanism, constitute an invisible government which actually prevails throughout the country. Prevail over the people and their opinions and shape the tastes of the people whom they themselves have never heard of, but who understand the mental processes and social patterns of the masses. This type of control is, however, important to keep a large group of people working together as a functional society. However, now come to a new level of cycling history, with the last 70 years, the plan will be worked cracked. Through the media lying, cheating, propaganda transmission, easily available credit, the so-called cheap oil, endless commercial expansion, effortless marketing, ongoing war, the banks and large corporations, elected politicians, high-class in favor of the tax system, and lobbying by the staff of the oligarchs benefit of written laws – all of these have been created check the commoners and enrich the modern aristocracy, at least for the 2008 economic crisis. Linear thinkers in government, commerce, banking and the media confirm straightforward triumph of progress, while allowing recovery from the crisis, but in reality, they deliberately ignore the evidence of the history of the situation from a different evolution because they recognize how vulnerable their positions of power. Strauss–Howe theory is that history repeats itself in cycles of about 80 years – a new crisis comes about 60 years after the previous approach, the crisis peak occurs around 80 years after the last peak of the crisis. Each such a turning point, however, swept away the last of the existing social order. According to this theory, the US kriisitsüklid occurred as follows: first crisis was the American War of Independence (1775-1794 took place, was the peak of the crisis year of 1781), secondly, the US Civil War (from 1861 to 1865, the peak year 1863); thirdly, the Great Depression and World War II (1929-1946 , culminated in 1944), and the fourth global economic crisis (2008 to about 2029, presumably peak of 2025). In September 2008, the global economic crisis that started two decades, probably noted the length of the episode begins, whose harsh conditions become progressively worse, the closer we come to the tip of the crisis. This time, most of those in power are trying to implement all kinds of fiscal measures, valeinformeerimise organizing campaigns to keep the attention of the people dispersed and confused houses. Already have managed to convince a large part of the public at 0% interest rates, while the addition of 1 trillion dollars (per year), the already large national debt of the United States, allowing the Federal Reserve to buy Wall Street 3 trillion dollars in debt. It has, however, created a high level of inflation, energy, food, health care and student areas and the real wage decline. All of these changes are advertised as the necessary steps to normalize the situation, but in fact serve only benefit from them the most affluent. The current state of the US economic, financial, political and legal system indicates a malfunction and does not remember a strong structure to be working properly. This fact, however, masked, and the crowd’s attention is diverted humblest problems – as long as that is not noticed how the state vaesub corporations and bankers skeemitamiste through. Those in power have no way to sell their arguments on the development, even if the enormous amount of evidence suggests the opposite. In order given to the public’s attention to other issues such as the massacres between the parties nääklused and the constant threat of terrorism in the unseen. A large part of the population is not interested even in these issues and happy to hold it is sufficient mass culture – different contents empty televised fancy “celebrity”, independent thinking and discussing foreign films cinema, an obsession with social media, the importance of rapid and short-term rewarding for fast food, etc. The world is filled with trivial problems, unintelligent käpiknukkude, clock propaganda and mindless consumption. All of these measures to calm the crowd, however, at some point begin to crack. History repetition of cycles can not be stopped – the people will wake up and demand change that is reshaping the current social and economic environment. Strauss and Howe wrote his theory in 1997, based on centuries of generations, based on the analysis of non-events, but the mood of crisis in generations, the basic elements. Even before the 2008 economic crisis in the beginning, it was clear that these basic elements – the debt, the disappearance of the middle class, and global unrest – and there were ägenemas. Mass media tend to ignore these problems, showing them smaller than they actually are, but if you do a bit of research, it is clear that the problems get worse. Are struggling with debt in the United States, China and several European Union countries, trying to cope with the ever-growing credit debt, student loans, housing bubbles and oil prices. The disappearance of the middle class does not come as a surprise, given that unemployment is a major problem in the developed countries, and more than 50% of the world’s assets is only 1% of people in. The US is a major problem in the militarization of local police stations, officials preparing for massive unrest, which alienates communities of their rulers, and the so-called defenders. Global anxiety are good examples of Hong Kong, the Middle East and held in Ukraine, as well as the direction of Japan’s more aggressive foreign policy. Propaganda can be formed opinions, but can not change the course of history or facts. US national debt has reached a record 17.5 trillion, an increase of 2 billion a day. Consumer debt has risen to new heights, reaching 3.2 trillion. Global debt level exceeds 230 trillion dollars, accounting for 313% of the global GDP. Most of the focus of launching huge corporations earn profits. If countries are trying to solve their debt problems, allowing bankers, politicians and government bureaucrats to determine more debt, reducing interest rates to zero and to enrich the oligarchs, it all ends in disaster. People suffering must be interrupted at some point, and this may occur if the crisis worsens and people are discovering how their assets, hopes and dreams are destroyed. Given the high percentage of the population is unemployed or working in low-paying part-time job, it is easy to understand how you can grow discontent with the current system. This is how the situation is managed anti meeleavaldamisega, 2011, showed us the Occupy Wall Street protests. Instead, in order to initiate a dialogue with the protesters, the search for solutions that would help ease the situation and take account of their voice, instead of protesters began to oppress the help of the police forces. At the same time it was shown in the media as protesters näotuid, riotously vain young people who just want to cause chaos. In the later stages of the mass media of the United States came into force at the Occupy protests in complete silence – Contribute to the fact that if they do not talk about, it is believed that no protest is taking place, and the whole business will sink into oblivion. In addition to public voting irregularities Edward Snowden revelations have also shown that the government does not respect people’s right to privacy, at least not if they can justify the violation of privacy, national security issues. If real, these alleged threats to people is, it let everyone decide on their own, but it is certain that the alleged terrorist threat to fight under the guise of a militarized local police forces to monitor citizens’ reluctance to come into, the spread of ideas and potential leaders of the protest. Global unrest has reached a new level when you look at Brazil, Mexico, Hong Kong, Egypt, Spain, Greece, France and Turkey jerkily demonstrations. It is also lokkamas violence in Ukraine, Iraq and Syria. A number of armed conflicts can be blamed on the decisions of the US armed with various dictators who were useful to them at some point. There are also problems former CIA plans that have undermined the influence of various democratically elected governments. Rampant violence, however, reap the benefits of the war industry and banks – can be enormous income from the sale of weapons of war will be financed through borrowing. Contributing to the war is therefore practically equal to the national debt slavery arms and dependence. The mass media do not talk about how the United States has historically been an armed terrorists who are killing in Syria now massively both soldiers and civilians. It also ignores the fact that, under the reign of Hussein’s Iraq was a modern, stable, non-religious, the oil-producing country, which was not of Al Qaeda or crazily violence. All that changed when the US invaded a sovereign state valeettekäänetel, wasted 1 trillion dollars in state assets, killed more than 100,000 Iraqis and left tallermaaks religious violence in Iraq. Also, do not talk about how the Libya deposed former dictator auxillary leaving the country into chaos and civil war. The world has reached a point where the heads of the various decisions have an extremely sensitive topics (debt, the disappearance of the middle class, and global anxiety) to high pressure. If the crisis worsens and reaches its peak, the world can be thrown into chaos, which hopefully will not be completed using a nuclear missile of a button. Sooner or later, the debt bubble burst in the world, which leads to the property, labor, rights, and loss of confidence. This process is triggered by the massive civil unrest, which has been quietly preparing for the years of decline of the middle class and the destruction of the current structure of society. Where in the world are exacerbated by resource wars, religious extremism and the spread of nationalism, the global war becomes an increasing probability. Where would our world and society at the heart of this crisis is moving, it is not yet certain. This could result in a crash if the progress, but it is certain that cooperation, sharing of responsibility, bold positions of peace and co-existence, and inspired leaders are essential to survive the upcoming challenges. Sources: The Burning Platform (longer article in English, we recommend you read! ), Wikipedia.